Hello fellow anglers, It is definitely fall. I took a week off to go fishing and ran into pouring rains one day to forty mile an hour winds two days later and then to the most picture perfect day we have ever had on Pyramid lake. Fishing this time of year is fantastic when you get get out. But, unfortunately there are some closures to remember this time of year also. In this report I will give you first hand experience of all the places we fished as well as other anglers experiences. LAKE TAHOE; Great news for fellow anglers, as the Cave Rock boat lunch has opened to public use once again. When the wind is not howling, the fishing has been good for the mackinaw. 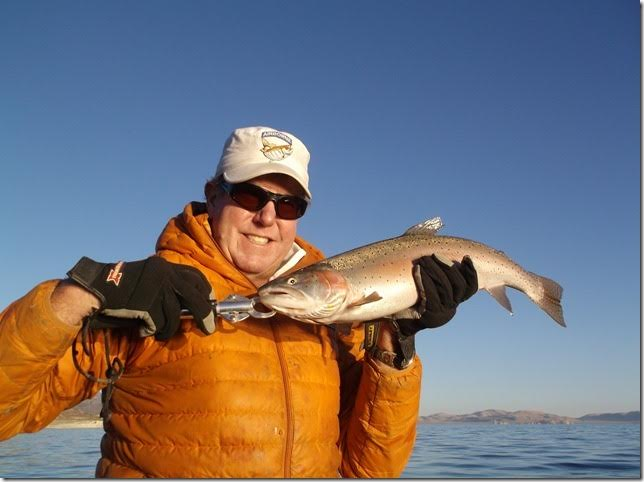 Most anglers have been fishing the Tahoe shelf to Cal/Neva point in 150 to 220 feet of water. Eagle Rock has also been productive. A set of flashers or a medium silver or white dodger followed by a live minnow right on the bottom. Average fish have been in the 3-6 pound class with a few in the 10 lb plus club. As the days get shorter, the top line action should pick up fro rainbows and browns. Best areas have been from Cave Rock up through the Logan Shoals area. A number seven silver patterned Rapala has been most productive. For more information call Blue Ribbon Fishing Charters at 530-544-6552. SILVER LAKE; The camp areas are closed for the season. The boat ramp is open, but I would recommend smaller vessels. I spoke to a fellow angler that fished it last week. He was using Rapalas and Needle fish. A few hours of non productive fishing he loaded up his boat and ventured to Bear River Reservoir. Here the lake level was way to low and was to unsafe to launch. CAPLES LAKE; The resort has closed for the season and will reopen in spring. Due to the untimely passing of owner John Voss the resort will not be open for the winter season. The E.I.D launch facility has also closed for the season. Shore angling this time of year can be very rewarding, as the browns will be feeding closer to shore. Night crawlers or Kastmaster lures are most productive around the dam or the spillway area. The Woods Creek area is hot and cold this time of year. I also recommend to use caution when hiking down to the area, with the recent snow/rains and colder temperatures. Footing can be an issue. RED LAKE; Cooler temps have activated some fair fishing on the lake. A few reports of small rainbows from anglers using salmon eggs or night crawler have come in. BLUE LAKES; As of this week the road is still open, but that can change very quickly as weather will shut it down with in a days notice. A report from one angler that took his small boat up there a couple weeks ago. They trolled with flashers and worms and had a slow but productive day for small rainbows. WEST CARSON RIVER CALIFORNIA SIDE; With the recent rains, the water level came up a little and fishing was fair. This was for anglers that do not mind a little walk through the canyon area. The river has not been planted since last month due to water level fluctuation. For more information stop by the Creekside Lodge. EAST FORK CARSON RIVER; Over the last couple of weeks the CFS has gone from 180 to 2000 and back down to 200 due to the rains we had last week. As a note, the Alpine Chamber of Commerce has donated $40K for fish plants for the rivers in Alpine County. A big part of your fishing experience, and they are not done. Renee and I fished last week for a couple days. We did have to do some walking but I tell you. We caught and released over 15 fish each day. The fish averaged 12-14 inches with the exception of three that Renee caught in the 2 pound class. We used 1/8 ounce black and silver or yellow and silver Panther Martin spinners. Powerbait was hot for many anglers, but if you are going to catch and release use the small spinners. If you use Powerbait, your fishing adventure may be over sooner than you wanted fish. Fly fishing was good using a copper jon with a a black wooly bugger. The water has cleared up and fishing has been very good. For more information stop by the Creekside Lodge. INDIAN CREEK RESERVOIR; The lake level has dropped a bit allowing you to drive around the cove to fish by the dam. With the weather temperatures getting cooler. The weeds are breaking up and the lake is clearing up but not completely weed free yet. We ventured out last week to fish for 2 hours until the wind came up about 11 am and blew every one out of the area. I talked to one angler that caught a nice 18 inch rainbow using rainbow Powerbait. The campground and boat ramp is closed for the season. Anglers can still launch small boats off the unimproved launch. 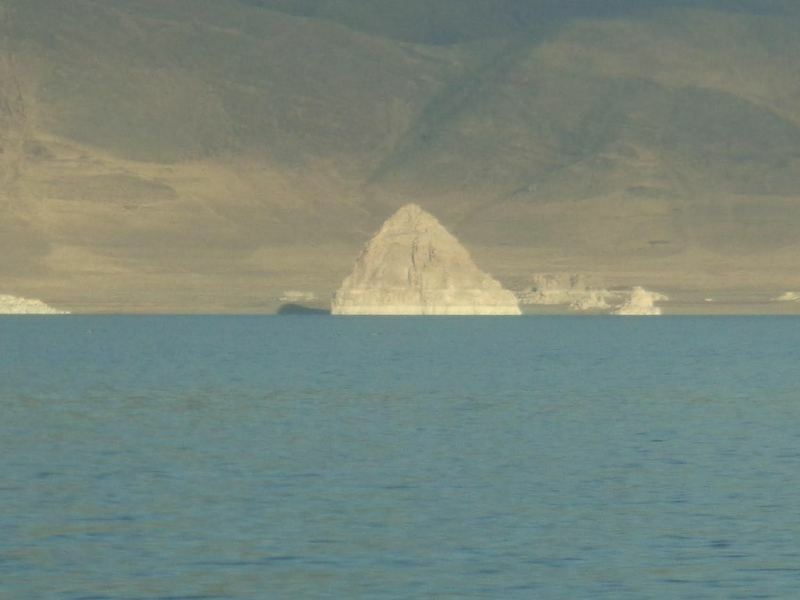 Alpine county is planning to plant the lake towards the end of November. With cooler weather the fishing will only get better. I have given the lake a new name, "Windian Creek Reservoir". Some how that valley has it own vortex of of weather it creates all by itself. TOPAZ LAKE; Fishing would be fantastic if the lake were open to fishing. The NDOW has started their year end fish plants. This month they have planted 2500 lbs of Triploid rainbow strain, 2000 lbs of the Incline rainbow strain and 4700 lbs of the Tahoe strain rainbow trout. The lake will open to fishing on January 1, 2017. PYRAMID LAKE; I venture out last Friday with fishing partner Tom Blotter from Minden NV. We started about 630 am and trolled north through windless Bay up to Monument Rock. I fished a 1 once red/black dotted torpedo spoon while Tom used a 2 ounce two tone lime torpedo spoon. We were fishing lead core with 4-7 colors in 30 to 60 feet of water. The fishing started off good with fish in the 18 to 24 inch class. The farther north we ventured, the slower the bite became. We decided to fish the Separator area, but before we did that we headed farther south past the nets toward popcorn. We fished right on the drop off areas through the weed lines. By 4:30 we had at least five double hookups and had caught and released approximately 20 fish a piece. The weather was warm and the lake fairly flat. We never had the time to fish the Separator area. Next adventure we will. NEVADA FISH PLANTS; Mitch Pond, Baily Pond, Mountain View Park. UPPER TRUCKEE RIVER, TAYLOR CREEK, TROUT CREEK; Closed to fishing until July 1,2017. 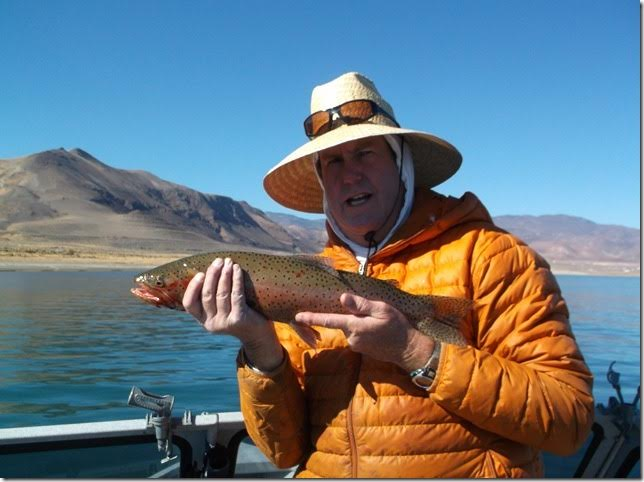 Fishing season will close for Inyo and Mono Counties on November 15, 2016. Most of our rivers in California will also close on this day. Check your regulations for special catch and release areas that stay open though our winter months in California. Most of the campgrounds in Alpine county have closed for the season. The Carson River Resort is open all year for RV and tent camping. 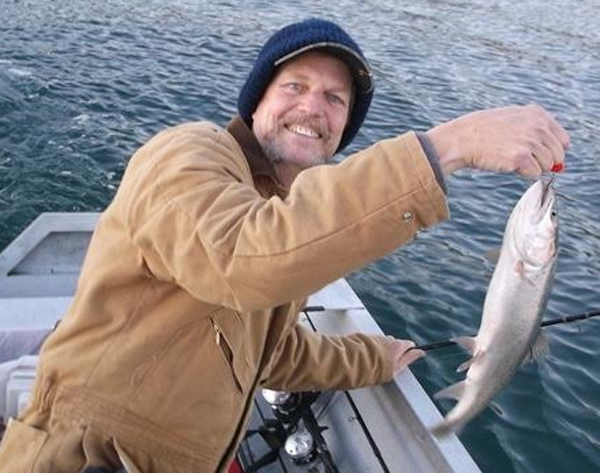 If you get a picture of your catch, send it to dprice@recordcourier.com. 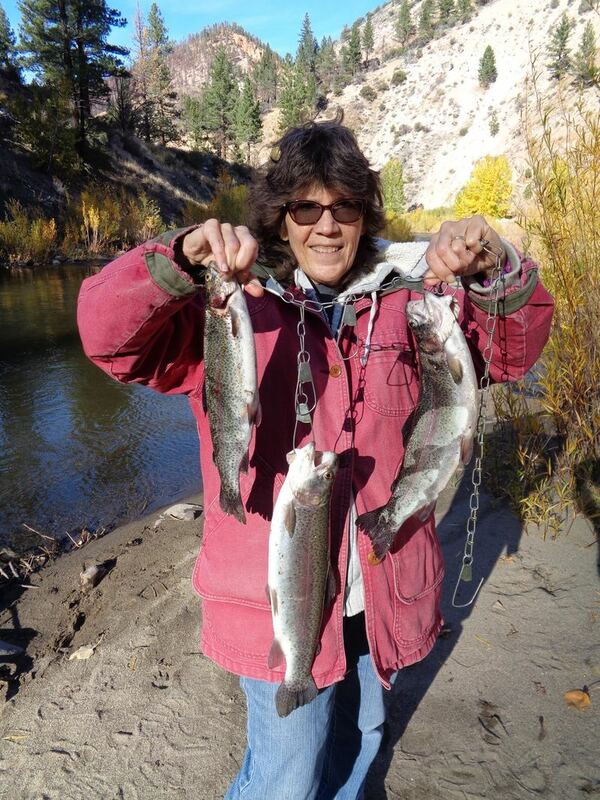 If you have a report or a question in our local fishing area call the Naw line at 775-267-9722. Good fishin' and tight lines.